A classic opening Gap trade. 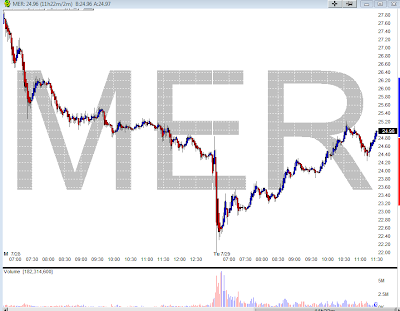 News came out last night that MER was selling 200 million shares to raise capital to stem its losses from its CDO's. I'm sure swing traders are having a difficult time trading these markets with 1 day down 240pts and the next day completely reversing its losses. I actually made money from 2 short scalps. 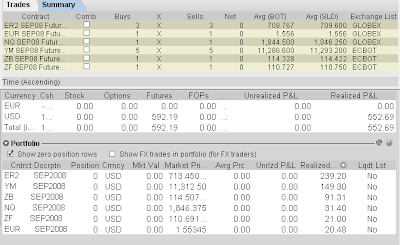 I also had a good long on ZB off the bottom but sold way too soon. I actually tried to trade a long bounce on the Euro, but it never worked out as Crude Oil is weak and money is flowing back into the US dollar. I shorted ZB last night. This trade was up as much as $700, but I wasn't around to cover it at the time. 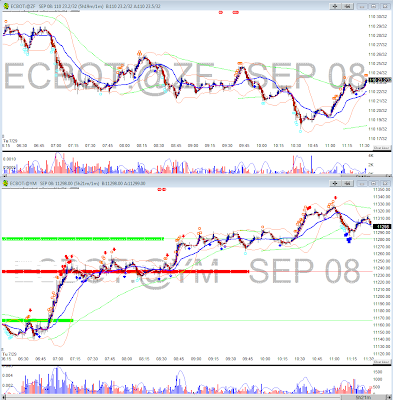 This trade was based off my bullish bias for 30yr bond yields rising. Bond Yields are near resistance from last June, so my bias is more neutral until after the next FOMC interest rate decision. You are definitely right - this is not a fun market for swing traders. That's the Nasdaq for the past six days. "see"your "future" equity curve,chances of big blowout days in a row..very intresting tool..